On 6th June the museum hosted a talk on the Staffordshire Hoard. 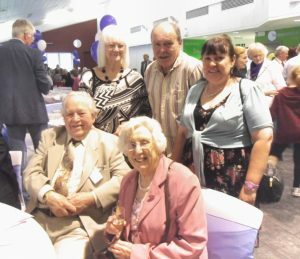 Museum volunteer Dorothy Robinson attended the talk, and she has submitted this report. We hope that everyone enjoyed the evening as much as Dorothy! 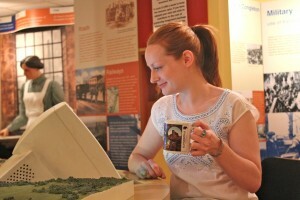 Museum volunteer, Sam Vinsun, relaxes with a cup of tea in her new Congleton Museum mug! Pop in to the museum and get your mug while supplies last! The museum has some rare books and manuscripts in its research library. A team of volunteers has been trained to support visitors in their search for people, places and publications. The library will be staffed from 1200 to 1600 on Tuesdays,Wednesdays, and Thursdays. Other times/days can be arranged by prior appointment. Access to the library during these times is free to Friends of the Museum. Other visitors will have the first half hour free then a charge will be made. If anyone wishes a member of the research team to undertake research on their behalf, please enquire as to cost. My name is Sam, and I am a relatively new volunteer to Congleton Museum. What most people don’t realise is just how many objects we have crammed into this small area. I spend my time at the museum updating the collection archives, which is an endless task. However, I have found out a lot about Congleton in a short space of time! Gibbs Crawfurd Antrobus had a pet monkey named ‘Jacko’, who was buried in the kitchen garden. A small headstone was erected in his memory. Eaton Hall was the first place in the area to have an air raid siren installed. The lawns were cut by a large mower pulled by a Shire horse. Nothing unusual there, however, when the tennis courts were cut, the Shire horse had to wear leather boots to prevent horsey damage! When the family went away, the staff would meet in the house for tea and biscuits. Makes you wonder what else they got up to! One head gardener had a pet robin called Herbert! Sadly, the main hall was demolished in 1980, however aspects of its history are stored in the museum’s archives, including a photo album of containing some interior photographs. You can find out more about Eaton Hall, as well as other notable Congleton properties, in a series of new booklets by Lyndon Murgatroyd extracted from his book ‘Who lived in a House Like This?’ These are now available from the museum shop.